Mr. Johnson now owns one hundred and sixty acres of land, but farms a half section, as he rents one quarter section. Mr. Johnson and his family belong to the Swedish Mission church at Wasusa. In politics Mr. Johnson is independent. The gentleman above named has resided in Boone county since the days of its earliest settlement, during which time he has become familiar to all who reside there, and takes a foremost place among them as an energetic agriculturalist and earnest public-spirited citizen. He owns a valuable farm and makes his home on section thirty-three. John T. Coyle was born in Cook county, Illinois, on April 16, 1863, and was the youngest of three children in the family of Patrick and Margaret Coyle, the former a native of Ireland, born in 1827, and coming to America when about nine years of age. He was married in Utica, New York, to Margaret Ely, in 1846, and had two daughters and one son, our subject; Catherine, who became the wife of George E. Williard, residing in Columbus, Nebraska; and Margaret, wife of David Spencer, they living in St. Edward, Nebraska. Patrick Coyle and his wife settled in Illinois after having spent several years in different states, and made that state his home up to 1871, when he came to Nebraska, homesteading in Boone county, on sections thirty-three and thirty-four, township nineteen, range five, building a dwelling house on section thirty-three, the lumber for the same being hauled from Columbus. From the very first Mr. Coyle took an active interest in the building up of his adopted county, and became known throughout his part of the state as one of the prominent public-spirited citizens. He died on the home farm on the eighteenth of June, 1904, and had survived his wife for twelve years. John T. Coyle practically grew up in Boone county, coming here with his parents in his ninth year, and he still occupies his father's original homestead, which has been cultivated and improved until it is now one of the most productive and best equipped places in the section. On November 13, 1888, our subject was united in marriage to Miss Nellie Fodey, the ceremony taking place in St. Edward, where both were well known and had many friends. Miss Fodey was a native of Cook county, Illinois, and her family still reside in that state. One child has been born to Mr. and Mrs. Coyle, William Patrick, now in his twentieth year. The family have a pleasant home, and are greatly respected in their community. The prosperity enjoyed within the borders of eastern Nebraska is due largely to the enterprise and thrift of the agriculturalists of that region. Their well improved and tilled farms show good management and painstaking care, and in no locality is this more apparent than in Antelope county, where Mr. Snider resides. He is a substantial farmer and ranchman, who has acquired a good home by persistent industry and honest dealings, and is highly esteemed as a worthy citizen and progressive agriculturalist. W. H. Snider is a native of Andrew county, Missouri, born January 12, 1851. His father, Samuel Snider, was in the civil war, enlistingin Company G, Missouri Infantry, under Captain Scott. He enlisted in 1862 and remained in the army until 1865. Our subject's father died in the year of 1909 at the advanced age of eighty-four years, honored and respected by all. From Missouri our subject went to Iowa, and then to Oregon and worked in a logging camp for a few years, going from there to Butler county, Nebraska, where he farmed until 1902. He then came to Antelope county in 1903, buying three hundred and twenty acres of good land in section eight, township twenty-six, range seven, where he has built a good home and has one of the finest groves in the country, the grove containing twelve acres of trees. This year Mr. Snider raised twenty acres of oats and one hundred and fifty acres of corn. Mr. Snider was united in marriage January 1, 1883, to Miss Jennie Drumond. Mr. and Mrs. Snider have had five children born to them, whose names are the following: Edward, William, Walter, Charles and Earl. Mr. and Mrs. Snider enjoy the high regard and esteem of all. Edward C. House has long been identified with the business life of Custer and adjoining counties, and is in touch with various real estate firms in other states. He was born on a farm near Portage, Wisconsin, June 28, 1858, ninth of the eleven children of James D. and Francis House, natives of England. He is the only one of the family living in Nebraska, although he has three brothers and four sisters now surviving. The parents came to the United States in 1848, bringing with them four sons and one daughter, six sons and four daughters being born to them in the United States. Two of the sons served in the civil war and one of them, John, was confined in Libby and Andersonville prisons. he went to Dakota, where he began soliciting fire insurance, with Sioux Falls as his headquarters. In 1886 he came to Broken Bow, Custer county, Nebraska, and engaged in the insurance and real estate business. He is the oldest active real estate dealer in Broken Bow, in point of years engaged in the business, and is widely known in that field. He has been active along all lines of progress and has served on the city council and in other public offices. He is a self-made man, having small opportunities in his youth to advance himself, as he could attend school only during the winter terms. He helped to care for his mother until her death, in 1884. Mr. House was married in Broken Bow, July 2, 1890, to Susie I., daughter of Mr. and Mrs. William Cole. Her parents came from Illinois to Nebraska in 1888, and in 1899 moved to Boise, Idaho, where both died. Mr. and Mrs. House have two children, both born in Broken Bow: Delia and Nathaniel J. The gentleman whose name heads this review has been familiar with Nebraska since 1866, when, before his marriage, he sojourned a few months in the state in the construction of the Union Pacific railroad, being employed driving an ox team between Omaha and Columbus. Previously he had been employed in a like capacity on the Mississippi & Missouri railroad, (which is now known as the Rock Island), between Grinnell and Council Bluffs, Iowa. After completing his work at Columbus, he wished to return to the west, and in so doing was obliged to walk three hundred miles on the roadbed to a point some seventeen miles west of Des Moines, the fartherest point west to which the tracks had been laid. His next job was on the gravel train surfacing the line, and when work in that department was ended, he returned to Davenport, Iowa, where he had first obtained work on railroad construction. Mr. Huwaldt was born July 4, 1842, his birthplace being about six miles from Keil, Holstein, then a province of Denmark, in sight of the ocean. His parents were John and Magdelena (Graeber) Huwaldt, who came to America in 1871, reaching Chicago at the time of the great fire, when they were driven from the place they had stopped on two different occasions. They went to Davenport, Iowa, after a short stay in Chicago, where the former secured employment its nightwatchman in a factory, holding that sitnation for about seven years. In 1880 the family removed to Nebraska and resided there permanently, the father dying when eighty-five years of age, and the mother at eighty-six. Our subject was a brick maker by trade, learning the work in Germany. Trouble between Germany and Denmark had been brewing for some years, and it so happened that there had been a clash between the two nations along the border. Mr. Huwaldt, who had been sent to deliver to the army some straw, was pressed into service to bring some wounded men into Kiel, this set him to thinking that he was liable to be drafted and might soon be in a hospital or under ground, so with several companions he started out - no passports being necessary, owing to the disordered state of the country - and embarked at Hamburg, on February 17, 1864, for America, landing in Castle Garden after a voyage lasting seventeen days. With some friends, Mr. Huwaldt came west, stopping at Davenport, Iowa, where for the first year he worked on a farm near that place; the following year he found employment on a steamboat plying the river between St. Louis and St. Paul, and here learned his first English, which, as usual, was profanity of the picturesque variety common to the vocabulary of the second mate. Several years were spent following different lines of work, latterly doing teaming in Davenport. In 1878 he traded his home in that city for two hundred and forty acres of land in Pierce county, Nebraska, receiving besides three hundred dollars in cash. He immediately moved on the place, section eighteen, township twenty-seven, range two, built a small shack, for which the lumber was hauled from Yankton and Wisner, the distance to both places being over fifty miles. The building was a rude affair, and to make it more comfortable he fastened willow branches between the studding, plastered the space back of them full of mud, serving to keep out the cold and make it steadier during the high winds which swept the plains. He later erected a comfortable house and latterly a fine dwelling in keeping with the size of the estate, which from time to time he increased, finally acquiring more than seven hundred acres of good farm and ranch land. He has, however, disposed of a part of this and retired from active labor, purchasing a pleasant home in Osmond, where he is prepared to enjoy his declining years. 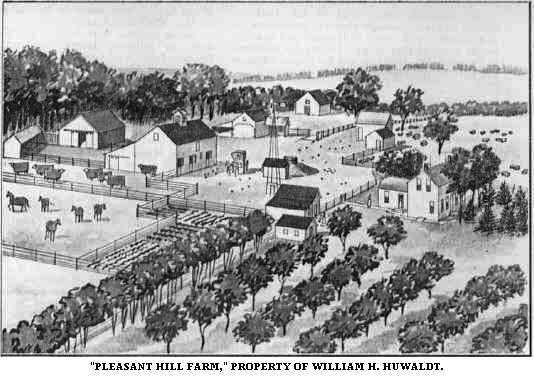 A view of the old home place, known as Pleasant Hill Farm, with its five or six acres of trees and two acres of orchard, is to be found on another page of this work. Mr. Huwaldt was married at Davenport, Iowa, January 9, 1870, to Miss Mary Mehrens, a native of the village of Klein-Volsted, Holstein, who in 1886 came to America with her parents, Joachim and Margarita (Siems) Mehrens, natives of Scheurp and Sigeberg, respectively, villages of Holstein, then a province of Denmark. Mr. and Mrs. Huwaldt have had ten children. eight of whom are now living namely: Henry, married Maggie Koppelmann; Annie is the wife of Fred Dau; Emma, is Mrs. Henry Kaehler; Herman, married Lena Wecker; Alvina, is the wife of John Rohrberg; Ida, is the wife of William Beckman; Sophia, is Mrs. Henry Bronkherst; and Minnie, now Mrs. John Lorenz, all of whom are well settled in life. Mr. Huwaldt was reared in the Lutheran church and is a thorough christian gentleman. He is a member of the Sons of Herman and is active in the work of that lodge. During his residence in Osmond, Mr. Huwaldt has held local office, at the present time serving in the city council. "Pleasant Hill Farm," Residence of William H. Huwaldt. Kendrick Willard Kimball is one of the most successful farmers and stock dealers of Custer county, is a native of Oshkosh, Wisconsin, born February 5, 1851, fourth child of Kendrick and Mary (McDonald) Kimball, who were parents of two sons and four daughters. When he was about two years old the family moved to a farm seven miles north of Oshkosh, in Winnebago county, and there he was reared to manhood, receiving rather a meager education in the district schools. At that time Oshkosh was a settlement of slab shanties in the lumber district of the state and the people in the neighborhood had but few comforts and conveniences. When in his nineteenth year, Mr. Kimball started in life on his own account, making his home in Winnebago county, with the exception of two years in Calumet county, until the spring of 1882. He followed railroad work in his native state and then returned to farming. He was married at Stockbridge, Wisconsin, October 19, 1875, at the home of the bride's parents, to Miss Myra Bourne, daughter of Captain Franklin and Mary (Smith) Bourne. Captain Bourne followed the sea for twenty-five years, much of the time in command of a vessel sailing from New Bedford, Massachusetts. In the spring of 1882, with his wife and three children, Mr. Kimball came to Grand Island by train, thence by wagon to Custer county, and located on his homestead on the northeast quarter of section seven, township sixteen, range seventeen, landing at this place May 10, 1882. This remained his home until his retirement and removal to Ansley in 1911, at which time he had two hundred and eighty acres of land in the home place, one hundred and sixty acres in the homestead, and one hundred and twenty acres in a timber claim. He has passed through the years of drouth, the years of panic, and the years when people with the money to pay for food supplies found them scarce and hard to buy. The first trading point was at Grand Island, seventy-five miles distant, and it took five days to make the round trip. For the past thirty years Mr. Kimball has been identified with the progress and development of central Nebraska and he has always given his assistance to the promotion of educational measures and advancement along all lines. His brother, Frank, came to York county, Nebraska, in 1877, and in the fall of 1879 came to Custer county, being a pioneer homesteader, but he is now a resident of Cloud Chief, Oklahoma. He and Kendrick were the only members of the family who came to Nebraska and none of Mrs. Kimball's family came. Seven children were born to Mr. Kimball and wife, as follows: Harry, an undertaker of Broken Bow, was born in Wisconsin, married Miss Emma Ward, and they have one child, Mamie, who was born in Wisconsin, married Arthur J. Anderson, a farmer of township sixteen, range seventeen, and they have four sons; Jessie, also born in Wisconsin, is the wife of John Hall, who lives in Ansley precinct; Bert, born in Custer county, now living near Berwin, married Mabel House, and they have two sons; Kendrick C., an electrical engineer, lives at Trident, Montana; Ruth, is the wife of Uriah S. Louden, and they live on the home farm; Theo., is at home. Mr. Kimball makes a speciality of feeding stock and shipping hogs and also a deals in other stock. He improved and developed a fine grain and stock farm, and is successful as the result of industry and energy. In political views he sides with the republican party, as do all his sons and sons-in-law. He is a member the Modern Woodmen of America, to which two sons and as many sons-in-law also belong. Like most of the neighbors of the vicinity, Mr. Kimball attended the sale nearby on January 12, 1888, and was caught away from home in the blizzard. He remained up all night, taking care of his cattle. In 1894, the dry year, he raised but seventeen bushels of wheat on thirty-five acres of ground, and on forty-five acres not a ear of corn, though it gave promise of a fine yield until a day of hot winds, when it was baked dry in the sun. Hail had destroyed nearly every growing thing the year before, making a period of great hardships. A "soddy" sheltered the family from 1883 until 1904, when the present residence, a neat cottage, was erected. We give a view of it on another page, together with the immense barn and other excellent outbuildings. The place is known as White Clover Farm. In the fall 1911, Mr. Kimball purchased a neat cottage home in Ansley, and retired from active farming. 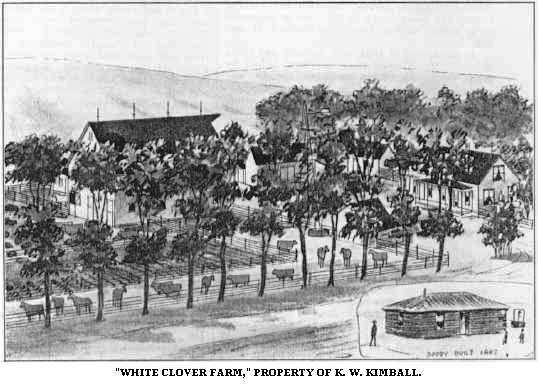 "White Clover Farm," Property of K. W. Kimball. Another well-known and highly esteemed old settler of Pierce county, Nebraska, is found in the person above named. He has made this region his home for upwards of thirty years, coming here as a boy of thirteen, and during that time has experienced the hardships encountered in the early days, and later has accumulated land, which is located in section twenty-three, township twenty-eight, range three, Pierce county, Nebraska, where he is considered a promment and respected member of the community. and who was married in 1849 or 1850 to Miss Alma Helena Geest, a native of the same province. He died in 1891, at the age of sixty-seven years. Mr. Petersen's father brought his family to America about 1865, sailing from Hamburg, Germany. After landing in New York, he came to Davenport, Iowa, near where they resided until 1881, the father keeping the family in town while he sought work in the country, and later rented a farm, on which they lived until removing to Nebraska. They came to Pierce county in 1881 and after renting three years south of Pierce, our subject's father bought eighty acres, on part of which Osmond now stands. On April 17, 1881, while living near the river bank south of Pierce, they experienced a flood, the water standing three feet deep in the house, and did not recede for three days; during this time the family lived upstairs, having to live on cold lunches, as the stove was under water. At this time they lost what grain they had in the granary, purchased to feed their stock going until they could raise a supply. At the time of the blizzard of January 12, 1888, Mr. Petersen was at school, and made his way home, half a mile, through the blinding, suffocating storm. He was in the country early enough to see antelope grazing where Osmond is now located, and saw many prairie fires, although the family never suffered loss through them. Mr. Petersen was married January 29, 1896, to Miss Anna Goetsch, a native of Davenport, Iowa. Her father, Henry Goetsch, was a native of Germany, but came to America when he was but twelve years of age. He was a member of the police force of Davenport for eighteen years. Here he married Cecelia Meinert, and in 1904 came to Nebraska, settling in Antelope county. Mr. and Mrs. Petersen are the parents of five children, whose names are as follows: Selma, Hans, Henry, Ella and Elmer. Mr. Petersen is a member of the Presbyterian church of his locality, and is affiliated with the Knights of Pythias and Modern Woodmen lodges. He votes the republican ticket. In 1890, Mr. Petersen bought the land he now occupies, and in 1895 erected the present residence, at that time one of the largest and finest in this part of the county. William James Crow, whose fine farm in Warsaw precinct, is a credit to the agricultural section of Howard county, is a man of untiring energy and classed among the wealthy and successful pioneers of that part of Nebraska, having passed through all the early Nebraska times. Mr. Crow was born in the province of Ontario, Canada, on February 12, 1862, and came into Howard county with his parents, Christopher and Susanne (McCracken) Crow, in the spring of 1872. he was the eldest in a family of ten children, seven born in Howard county. His mother died here in 1880, and after some time his father was married again to Margaret Crow, who, although of the same name, was no relation. They had eight children. The family settled on what is known as "Canada Hill," near St. Paul, and there William remained until he was twenty-one years of age, helping his father to develop a good farm, and in the meantime receiving a common school education. He was married there March 1, 1882, to Lottie Alice Hill, who was also a native of Canada and came to Nebraska with her parents, Edward J. and Alice (Horner) Hill, in 1881. After their marriage, Mr. and Mrs. Crow moved on a farm near Warsaw, which Mr. Crow had previously purchased, and they lived on this place two and a half years, then sold out and moved to Aricaree, Colorado. They farmed there for two and a half years, but did not meet with much success, so decided to return to Nebraska. After coming back to Howard county Mr. Crow purchased a farm on section twenty-five, township fifteen, range eleven, which has remained his home place up to the present time. He has built up a productive farm, carrying on grain and stock raising, and has a finely equipped place, supplied with good buildings, including a nice modern residence, and small orchard. It is situated on Canada Hill, and is a very desirable tract. Besides this farm, Mr. Crow owns half a section of land in Custer county, also some land in Lincoln county and a town residence in St. Paul. He is prominent and successful in every way, well known and highly esteemed by all, and both his wife and himself have many family connections and a large number of friends in every walk of life. Mr. Crow's family consists of seven children, as follows: Edward S., Bertha Alice, Ella May, Willard R., Adnelle, Leslie A., and Lottie Grace. Edward S., is married and living in Howard county on a farm. Walter N. Woody, a prominent figure among the farmers and stockmen of Valley county, Nebraska, is one of the earlier settlers of his region and has been associated with its progress and advancement. He was born July 27, 1862, in Dodge county, Minnesota, third of the ten children born to Joseph H. and Louisa (Wright) Woody, natives of Indiana, now living in Iowa. Besides Walter H., there are two sons and three daughters in Iowa, a daughter in South Dakota and a son, Jerome, in Arcadia, Nebraska. In early childhood Mr. Woody accompanied his parents to Jasper county, Iowa, where he grew to maturity, receiving his education in the local schools. his own account, and in March, 1885, he drove through from Iowa to Valley county, spending three weeks en route. He secured a homestead of one hundred and sixty acres of land near Arcadia, where he lived about three years. November 7, 1887, Mr. Woody married Katherine Hekler, who was born in New York state, daughter of Christian and Barbara (Mahle) Hekler, now residing in Valley county, and she has a brother and sister also living in that county. In 1891 Mr. Woody returned with his family to Jasper county, Iowa, remaining in that state until February, 1899, when he again came to Valley county, which has been his home since that time. He has purchased one hundred and sixty acres of land, comprising the southeast quarter of section fourteen, township seventeen, range fifteen, where he has developed a fine farm and is considered one of the most intelligent and progressive agriculturalists of the county. His dealings with his fellows are marked by upright honesty and reliability and he is known as a public-spirited, desirable citizen. Seven children have been born to Mr. and Mrs. Woody: Mary Elizabeth, Harry Alvin, Robert Earl, Carl Roy, Paul Christian, Clara Frances and Olive. The family is well known and its members have many friends. Mr. Woody was formerly a democrat, but, of late years is a believer in the principles of the people's party. He was reared in the Methodist church. Mr. Woody was born in a log house and for a few years lived on his claim in a sod house, which was later replaced by a small frame dwelling. Although not out in the storm, Mr. Woody well remembers the terrible blizzard of January 12, 1888, when so many lives were lost. A. E. Johnson, who resides on section twenty-eight, township twenty-two, range four, in Madison county, Nebraska, is one of the leading old-timers in that section, and has ever done his full share in the betterment of conditions throughout the community in which he has spent the past many years. Mr. Johnson is a native of Vernland, Sweden, born July 14, 1866. He was but two years of age when his parents left the old country and came to America, with their little family of two children, crossing the ocean in a steamship, embarking from Vernland province. The father was a carpenter, and on landing in New York they came directly west to Madison, Wisconsin, where Mr. Johnson followed his trade for ten years. From there they removed to Pulaski, Missouri, remaining for about one year. April 26, 1879, they decided to go farther west, so secured a team and wagon, loaded their household goods, and started on their journey overland, to Madison county, arriving there after a one hundred and sixty day trip filled with numerous incidents. Immediately after landing in the region, Mr. Johnson filed on a homestead, and with the help of his children built a sod house which was their dwelling for a number of years until they became able to put up a comfortable frame house. The lumber for this was hauled from Columbus, a distance of forty miles, which place was also their nearest trading post. They worked hard to improve their farm, and met with considerable discouragement and hardships, losing all their crops by the hot winds in 1894, and also suffering severely from blizzards, etc. As times grew better and the country became more thickly settled they prospered, and through thrift and good management succeeded in building up a fine property, having at the present time three hundred and twenty well tilled acres, the entire place in first class condition. They are engaged in the stock and grain raising business and are among the well-to-do residents of their section, our subject remaining with his parents up to 1894, at which time he started farming for himself on the place known as the Henry Smith homestead in Emmerick township. Mr. Johnson was married in 1898, to Miss Hannah Broberg. They have three children: Myrtle E., Florence D. and Melvin L., and their home is a pleasant, cheery spot. John D. Wieland has been with the Dierks Lumber Company since 1885, and for the past, eighteen years has been manager of the Callaway yard. He is one of the well-known men of Custer county and is a man of forceful character and business ability, who has made his influence felt in local affairs. He was born at Salem, Columbiana county, Ohio, February 4, 1867, youngest child of Daniel and Christina (Koupp) Wieland, who had five daughters and three sons. He has one brother and two sisters living, the brother at Red Oak, Iowa, and the two latter, Mrs. Frank Cozad and Mrs. P. B. Riley, in the Victoria creek neighborhood in Custer county. Sketches of Mr. Cozad and Mr. Riley appear in this work. The parents of Mr. Wieland were born in Wurtemburg, Germany, and married in. their native country. They came to America in a sailing vessel about 1853, first settling in Chester county, Pennsylvania, their home for several years. They then moved to Columbiana county, Ohio, and in the summer of 1867 to Montgomery, county, Iowa. The mother died in 1873 and the father in 1885.
in Broken Bow until 1893, in March of that year coming to Callaway to take charge of the yard there. He has helped build up a large trade and carefully takes care of the best interests of the company. Mr. Wieland was married in Callaway, March 28, 1894, to Elizabeth, daughter of Robert and Esther Thompson, a native of New York state. Her parents were natives of Scotland. Five children were born to this union, of whom four now survive: Robert D., Vern O., Neva, (deceased), Lester Dierks and Loretta, all born in Callaway. Neva died in February, 1910. Mr. Wieland is a representative citizen, interested in the progress and welfare of his community, and has a large circle of friends. One of the prosperous and influential farmers of Wayne county is Mr. Edward Sandahl, who owns a very valuable property in section fourteen, township twenty-six, range four. He was one of those wise and far-sighted pioneers who foresaw the prosperity which has attended this region and who accordingly, with the greatest perseverance, toiled along through the poor years and remanied [sic] to enjoy the results of many years labor. Mr. Sandahl is a native of the state of Illinois, having been born in Henry county, in 1858. He was the son of Samuel and Caroline Sandahl, both of Sweden, who came to America the year previons to his birth. They came in a sailboat, as was customary, and the voyage from Guttenburg to New York City took up nine weeks and three days. The father was an officer in the Swedish army but on coming to America, took up the trade of a carpenter. The subscriber spent his childhood in Illinois and received his education in the local public schools. In 1884, Mr. Sandahl came to Wayne county, Nebraska, where he purchased his present farm of one hundred and sixty acres from Joe Egler, who had taken it up as a homestead four years previous. Mr. Sandahl still occupies this farm, which he has improved in many respects, so that now it makes him a very pleasant, comfortable home. He has added to his first purchase until he now owns six hundred and forty acres. In 1882 he was united in marriage to Huldah Bark, of Mercer county, Illinois, who was born in Sweden, and they are the parents of seven children: Lillie A., wife of Ernest Hyps; Carl F., Edward L., Nettie F., George E., Edna C., and Huldah B. Both Mr. and Mrs. Sandahl are well and favorably known, and they are quite prominent in both a social and educational line. They are members of the Swedish Lutheran church at Wakefield. Among the prominent citizens of Merrick county, Nebraska, who has for the past many years taken all active part in the development of the county and is familiar with the changes that have taken place throughout the section, we mention the name of Austin Phelps. This gentleman is one of the well-to-do residents of Clarks, where he takes an active interest in all pertaining to the upbuilding of his home town. Mr. Phelps was born near Springfield, Illinois, May 26, 1839, and was eldest of two children in the family of John and Permelia (Austin) Phelps, who had one son and one daughter. Mr. Phelps was a farm boy, growing up on a farm seven miles distant from Springfield. In July, 1861, Mr. Phelps enlisted in Company B, Thirtieth Illinois Volunteer Infantry, on the first call for three hundred thousand men, and participated in the battles of Belmont, Fort Henry, Fort Donaldson and Shiloh. Mr. Phelps well remembers the first day the troops started out of Springfield under Colonel Grant; the first camp being made on the Phelps farm prior to the enlistment date of young Phelps. Mr. Phelps served one year and received honorable discharge on account of disability and returned to the farm home in Illinois. On March 2, 1869, Mr. Phelps was married to Miss Maria Cummins, who was also a native of Illinois. Mr. and Mrs. Phelps have four children living: Carrie, who is married to Al Locke, has four children and lives in the state of Washington; Mary, married to Frank Harland, has two children and lives at Spokane, Washington; and the sons, Edward and Carlysle, who reside at home with their parents..
On January 1, 1875, with his wife and three children, Mr. Phelps landed in Omaha, Nebraska, where he had shipped his stock and household goods, which he unloaded and moved overland to Merrick county, locating on a homestead farm in the Loup river bottoms twelve miles northwest from Central City. Here he followed farming and stock raising about twelve years, when he moved to Central City engaging in the hotel business, where he remained some ten years. He then made a change and moved to the town of Clarks, twelve miles east of Central City, where he continued in the hotel business until about 1902, at which time he retired from that business, but still owns the property. While not as active as in former years, Mr. Phelps with his sons, Edward and Carlysle, carry on farming and stock raising. Mr. Phelps has a wide acquaintance with the people of this portion of Nebraska, and the family enjoy the respect of many friends. Mr. Phelps and sister, Mrs. J. P. M. Howard, are the surviving members of the John and Permelia Phelps family. Mrs. Howard resides in Illinois. Jere B. Bailey, the hardware and furniture dealer of Naper, has been in Nebraska since the spring of 1883, and in that time has become thoroughly naturalized. In his advent to the state, his anticipations of the "wild and wooly" were fully realized. He landed in Valentine in April, and in dismounting from the train waded out into snow knee deep. Valentine at that time was a favorite resort of the cowboys, and the open range country developed a wild and reckless breed of them. Some of his companions were loth to leave the train, but Mr. Bailey made his way directly to one of the thirst emporiums, called up the house and stood treat. This won their friendship, brought him an invitation to their dance that night, and from that time on he was safe from molestation amongst them. He pre-empted eighty acres of land near the Niobrara, on which he lived most of the time until coming to Boyd county, about the time it was thrown open to settlement. In June, 1890, he filed on a homestead two miles northwest of Butte, and for the first summer lived in a tent. The Indians harrassed the settlers the first season, demanding money for the land, which they claimed. Some paid what was demanded, but Mr. Bailey, knowing the Indian character better, got out his "bull whip" and told Blue Eyes that he would pay with the lash if he were annoyed again, and experienced no further trouble. He lived on this claim until 1902, when he built a two-story frame store building in Naper and went into business there. He carries a line of hardware and furniture, and practices embalming and undertaking. His genial disposition and straightforwardness win him a goodly share of the trade tributary to Naper. Mr. Bailey was born at Waukon, Iowa, July 17, 1855, a son of Herbert and Mary (Crowley) Bailey, both natives of Massachusetts, who came to Iowa in the early fifties. Mr. Bailey was married in Valentine, July 14, 1888, to Miss Carrie Luber, who was born in Iowa, a daughter of George and Elizabeth (Beck) Luber. The father was a native of Bavaria, who settled in Iowa, where he died. The mother is a native of Wisconsin; she came to Nebraska and settled in Boyd county in the latter eighties with a daughter. They now reside in Butte; Miss Luber has for a number of years been a teacher in Nebraska, having kept school in Cherry, Keya Paha, and Boyd counties. Mr. Bailey lived in a log house in Cherry county. and while in Boyd his farm dwelling was a "soddy," the most comfortable house for any time of the year. At times they burned corn for fuel, as it was cheaper than coal. During the Indian scare in 1891, Mr. Bailey and wife were somewhat worried at one time by seeing signal fires burning On one of the buttes near where Naper now stands, and looking through a field glass could see men moving on the hill, but it was a false alarm. Mr. Bailey is a republican in politics, and a member of the Masonic lodge of Butte. In compiling a list of the citizens of Stanton county, Nebraska, who have aided materially in making of that region a thriving agricultural district, a prominent place must be accorded the gentleman whose name heads this article. For about twenty years, Mr. Muhs has been identified with the history and development of this section, and his labors to this end are well-known to all who reside in that community. He now has a pleasant home in section eleven, where he enjoys the contentment which comes from the knowledge of duties faithfully done. Mr. Muhs was born in the province of Schleswig-Holstein, Germany, in 1869, the son of Henry and Celia Muhs. The father was a small farmer near the village of Stein. The subscriber spent his childhood and youth in his native land, going to the schools there and helping his parents at home whenever possible. In 1882, Mr. Muhs came to America, going at once to Washington county, Nebraska, where he remained for a little over eight years. In 1890, he went to Stanton county, where he bought the farm which is still his home. He has made extensive improvements since buying this farm, one of the most notable being the planting of about one and one half acres of trees, which was about the first thing he did. The trees are all well-grown now, and very thrifty, and considerably enhance, the value of the farm. In 1896, Mr. Muhs was united in marriage to Miss Dora Peterson, a native of Germany. Seven children have come to bless their home, upon whom they have bestowed the following names: Henry, William, Walter, Ella, Eddie, Elsie, and Ernest. Mr. Muhs has prospered as well as progressed, and devotes some of his time to recreation, with his auto car and also to travel abroad where he visited the home of his boyhood days. He commenced with eighty acres of land, and is now the proprietor of eight hundred acres. The gentleman above mentioned is classed among the substantial and practical agriculturists of Antelope county, Nebraska, and is proprietor of a valuable estate in section twenty-seven, township twentythree, range seven, in the above named county and state. He has been a resident, of this locality for many years, and has acquired a host of friends, himself and famly enjoyiug the respect and esteem of all who know them.